Historical Map of the World. Political regions and countries, major mountains and rivers (although some are speculative), population and indigenous people are noted within each continent. The lower quadrants of the map contains details regarding general observations, notes upon discoveries in general, and historical and chronological notice of the principal navigators, the different directions which they took, the principal points they discovered etc. These include a list of voyages from 1432 to 1790 and include the explorations and discoveries of Gilianez in 1432, Cook, Perouse, Columbus, Bouvet, Americus Vespucius, Vancouver, Vasco da Gama, Anson, Bougainville, Middleton, Tasman and several others. 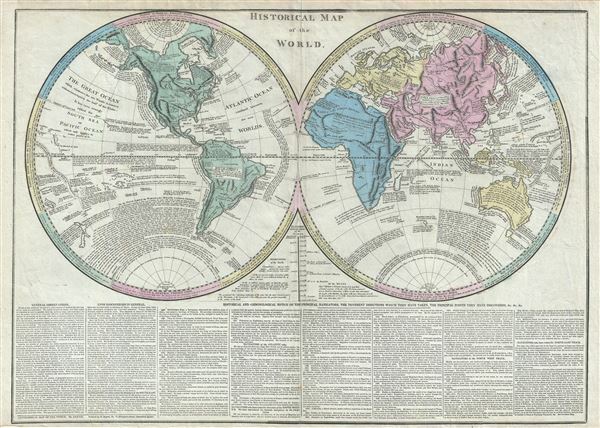 This map was printed in 1813 by R. Juigne for Le Sage's Historical, Genealogical, Chronological and Geographical atlas.